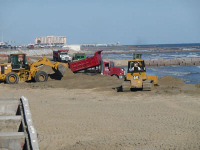 Beach restoration involves the placement of sand on an eroded beach for the purposes of restoring it as a recreational beach and providing storm protection for upland properties. Restoration is generally accomplished by bringing sand to the beach from inland sites or adjoining beach segments, or by hydraulically pumping sand onshore from an offshore site. The linkages between development and the persistence of sandy beaches are complex, and should be considered with care before construction near sandy beaches is permitted or undertaken. If dunes are leveled, vegetation removed, and/or solid jetties or seawalls constructed, the likelihood of committing the owners to repetitive and increasingly expensive beach restoration and renourishment is heightened. Rebuilding a natural beach is costly, and often ineffective. The forces precipitating the erosion generally cannot be allayed by the act of restoration, and in many cases the cycle inexorably begins anew. The failure of restoration projects is often attributed to, among other things, a lack of appropriate and affordable material nearby. Research demonstrates that replacement sediments often display unsuitable grain size, durability, and hydrodynamic behavior for a beach setting, and that sands derived from dredging on the adjacent shelf contain excessive amounts of fine sand and silt too small to remain on the beach. As a result, coral and hardbottom habitat offshore the restored/renourished beach can be stressed by increased sediment turbidity, siltation, and smothering. Renourished beach sand also tends to become compacted, reducing the quality of the nesting habitat. Compaction alters sand temperature and moisture levels, preventing adult females from successfully constructing their nests and/or affecting the development process of the incubating eggs. If restoration is unavoidable, replacement sand should be similar (grain size, organic content) to that which was eroded, thereby maintaining the suitability of the beach for the incubation of sea turtle eggs. Restoration should never occur during nesting and hatching seasons when heavy equipment and activity can deter nesting, crush eggs, and/or prevent hatchlings from successfully digging out of the nest. It is worth noting that there is an imbalance in the system somewhere when sand is lost from an otherwise predictable beach habitat and is not replaced by natural accretion processes. The underlying cause can be as direct as an up current solid jetty or pier that is literally “starving” the down current beaches by interrupting the longshore transport of sand and sediments. Or the impetus may be more subtle, as occurs with the removal of beach vegetation or when nearshore pollution retards the productivity of calcareous (coralline) algae and other sand sources. The best – and least expensive in the long term – way to reduce the need for beach restoration in the Caribbean and elsewhere is to define and enforce construction setbacks adequate to ensure that the development itself does not exacerbate natural cycles of erosion and accretion. Setbacks can also help to ensure that natural beaches will replenish themselves over time, following a serious erosion episode. Protect coastal vegetation. Damage assessments following the December 2004 Indian Ocean Tsunami clearly showed that coastal vegetation (e.g., mangroves, beach forests) helped to provide protection and reduce effects on adjacent communities. When this vegetation is cleared, the shoreline is more vulnerable to storm damage; conversely, establishing or strengthening greenbelts of mangroves and other coastal forests may play a key role in reducing the effect of extreme events, reducing the need for beach restoration, and minimizing economic losses.